Thank you for attending CAIR Georgia's Gala and supporting CAIR Georgia. Your presence Saturday night was very important to us and we were so pleased to see you attending our sold out event. We realize CAIR Georgia exists only to serve our community and could not function without your support. In order to improve your experience next year and to receive important feedback from you on your hopes and goals for CAIR Georgia in 2018, we will be sending you a short survey and we request that you please take a moment to fill it out. Asalaam Alaykum! May peace be upon you! 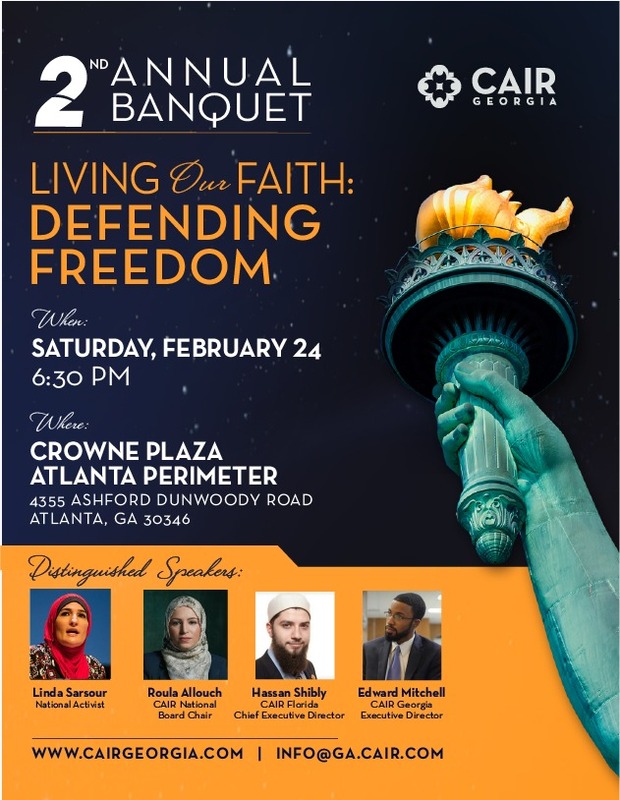 I am happy to announce that CAIR Georgia plans to host our 2018 fundraising gala, "Living Our Faith: Defending Freedom," on Saturday, February 24th, in Atlanta. Buy your ticket today! During our second annual banquet, we hope to celebrate the successes that CAIR Georgia experienced in 2017, raise funds to sustain our civil rights work in 2018, and recognize Georgians who contributed to our community over the past year. Our special guest speakers will include national activist Linda Sarsour, civil rights attorney Hassan Shibly, chairwoman of CAIR National's board of directors Roula Allouch, and another very special guest who we hope to announce in a few weeks, God willing. Served Georgia Muslims by delivering free educational presentations, including Know Your Rights seminars, Islamic Last Will & Testament workshops, Self-Defense seminars, Islam 101 speeches, and college lectures across the state. Protected Georgia Muslims by investigating anti-Muslim discrimination, building coalitions with other civil rights groups, and countering Islamophobia in both the court of law and the court of public opinion. Advocated for Georgia Muslims by interviewing all of Atlanta's major mayoral candidates, lobbying on Capitol Hill in DC, and engaging with the media, including CNN, The Washington Post, the AJC and Atlanta's CBS, Fox, ABC, and NBC affiliates. United Georgia Muslims to join protests in response to the inauguration, the Muslim Ban, and Charlottesville, and hosted a march in response to the genocide of Rohyingya Muslims, an interfaith food drive in response to an anti-Sharia hate rally, and protests in defense of human rights for Palestinians. Established a full-time office location in the heart of downtown Atlanta, and built a dedicated staff, including our executive director, a second civil rights attorney, a paralegal, and a communications director. Buy a Ticket: event tickets cost $50 per adult, which covers a three-course halal meal. Click here! Reserve a Table: your mosque, business or organization can buy a table for $500, and appear as an event sponsor. Click here! Sponsorship Package: sponsorship packages that include a table, an opportunity to speak during the banquet, a listing of your organization on CAIR Georgia's website, and other benefits, will go on sale next week, God willing. Thank you for your support. Please join us on February 24th, 2018, and please mention us in your prayers!